As a third-generation shoe retailer with family roots that date back to 1889, John Schuler is a natural. He grew up in a shoe store, sweeping floors, dusting shoes and working in the stockroom at Schuler Shoes as a kid. During high school, he worked on the floor as well as at a Montgomery Ward department store. He later managed Schuler stores and, in 1972, acquired the business from his father, Emmet. With knowhow honed over decades, you might say Schuler has veins of leather and shoe polish in his blood. The septuagenarian never tires of trying to improve his family’s business through selection, service, locations, décor, inventory, marketing, employee morale—you name it. But he is down to earth and humble despite his accomplishments. Schuler credits his talented management team for “making him smarter” and his approximately 250 dedicated employees for making the business the most successful it’s ever been. Just how successful? When Schuler acquired the business from his father, it was a six-store operation generating a collective $900,000 annually. 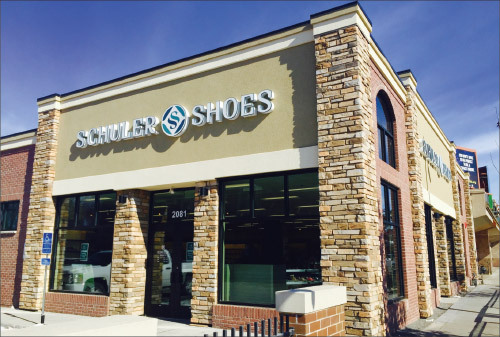 Today, Schuler Shoes’ nine stores, plus ecommerce, do about $50 million a year. Exactly how did Schuler make the leap from his original goal to ramp up growth to $500,000 per store to approximately 10 times that amount? How did he go from operating 2,300-square-foot formats to an average 8,000-square-foot outlets with a couple of 12,000-square-foot super stores in (relatively) sparsely populated Minnesota? Even allowing for the adjustment of inflation, that growth shatters reasonable expectations, especially in an industry that has seen epic levels of contraction at the brick-and-mortar level. When Schuler acquired the business, his father told him, “Hey, if you can get these stores each doing a $500,000, you’re gonna have it made.” Never could his father have envisioned just where his son, a natural born shoe retailer, would lead the family business. 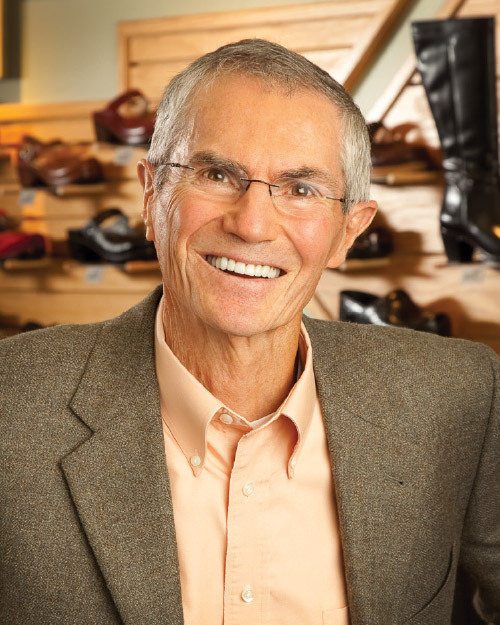 Chuck Schuyler, president of the NSRA, says Schuler has long since graduated to head of the class, calling him one of America’s leading independent footwear retailers and an inspiration to all. Schuyler ticks off a list of qualities that make Schuler a successful retailer. Passionate—he loves his work and it shows; Respectful—he treats everyone as he would like to be treated; Committed—to his family, employees, customers and business; Dedicated—he gives his all every day to ensure the company’s success; Honest—he’s a person of his word; Trustworthy—he has earned his reputation with the actions; Positive—he has a friendly and professional attitude towards everyone he meets; Knowledgeable—he stays up to date on industry news, product knowledge and social responsibility, and shares it with others; Impactful—he makes a difference to those who know him, personally and professionally. Schuler has built his sit-and-fit empire by adhering to retail and business basics—a fact that should be reassuring to mere retailer mortals. 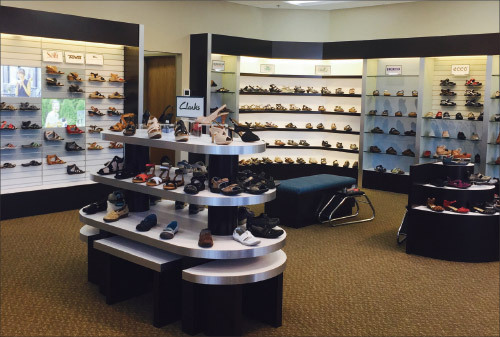 While many businesses have zigged and zagged over the years, Schuler Shoes has stayed the course on its comfort specialty format, starting with step one of its mission statement: The tradition of passing on the art of fitting footwear. The mission’s others tenets read like a how-to guide for a local, sit-and-fit business: offering an extensive selection of styles, sizes and widths; serving our customer, each other and our communities; kindness through a welcoming and friendly experience; and trust by sustaining relationships built on reliability and integrity. Schuler’s mission statement may be pretty straightforward, but it’s not easy to do well, especially day after day. There are many moving parts that can easily throw it out of whack—like poor inventory management or unhelpful customer service. It only takes one chink in the concept to trigger an outbreak. But such an epidemic is unlikely to take hold at Schuler Shoes, according to Kitty Bolinger, executive vice president of sales for Dansko. That’s because the commitment to excellence starts at the top with Schuler and flows through every aspect of the business. “John is committed to insuring each customer that visits Schuler’s will leave with their problem solved—whether it is finding the perfect shoe to go on vacation or solving for extreme foot issues—he makes sure he has the product and people to fit their need,” she says, adding every employee is trained to put the customer first. “He has career employees that develop personal relationships with customers,” she adds. “The employees are proud to work at Schuler’s and their attitudes reflect that.” Part of that effort also entails pioneering new brands, as he did with Dansko in 1995, and keeping a stable of tried-and-true brands. “He treats his vendor partners with the deepest respect, but pushes us to be better each year,” Bolinger says. more than 100 years, is a stand-alone, destination-sized, sit-and-fit format that proves excellence in retail basics can still be wildly successful. Like father like son: John and Emmet Schuler back in the day hawking some of the latest Schuler Shoes offerings. In fact, Schuler closed three underperforming stores almost immediately and bought a larger store in the Minneapolis suburb of Bloomington in 1976. He knew the store was doing more business than any of his current outlets at the time because he used to work there during high school. It was bigger and located at a high traffic intersection. He then invested in a complete redesign outfitted with professional fixtures and made a heavy investment in inventory. It would serve as a lab for his sit-and-fit vision. “I now had the atmosphere and the inventory,” he says. “It all came together.” The store’s sales took off, and Schuler adapted the model to his other stores as best he could or moved to bigger locations. By 1980, the then five-store chain was doing $3 million total a year, already topping his original $500,000 per store goal. Not having it in stock, Schuler says, is no excuse—not in the days of Amazon and direct-to-consumer (DTC). “If a customer comes into one of our stores and wants to by a certain brand and style and I don’t have it in their size, shame on me,” he says. “They’re making the effort to drive here, so I better have the inventory for them to walk out with a pair of shoes.” For the record, Schuler says the purchase rate of in-store shoppers is close to 90 percent. The industry average is about 60 percent. Let Go of the Lease! The first rule of retail is location, location, location. The second rule, as Schuler now sees it, is owning those locations. It marks his latest tack in guiding the chain to calmer and more profitable waters. Over the past couple of years, he has shifted gears to buying the buildings where his stores are or, if unable, moving them to buildings he can purchase or buy the land and build from the ground up. “Every five years, your rent goes up 10 percent,” he says. “That’s just the way it is.” Owning, on the other hand, is “no comparison” when managing fixed costs and building equity at the same time, he says. How fate and surviving a plane crash propelled John Schuler into a career in retail. Life has a way of changing one’s flight plan, so to speak. That’s what happened to Schuler, who at the time was bouncing from one Minnesota college to the next, taking business classes, when he met his future wife and decided it was time to stop (sort of) studying and start earning a living. He joined the family business full-time in 1964, the same year he got married, starting out as a salesperson. A couple of years later, Schuler graduated to store manager and, a few years after that, moved on to manage a new store in the Minneapolis suburb of Robbinsdale. Two years later, his father, then 72, decided to retire and offered to sell the business to his son. Schuler, who felt he had a firm grip on how to run the business after eight years working in the trenches, thought the opportunity was too good to pass up. Per usual, though, he did his research, soliciting opinions from friends and colleagues to make sure it was a wise decision. They told him resoundingly to give it a shot. “My dad gave me the opportunity to really make something out of it, and it just seemed like the most obvious thing to do,” Schuler says. Suffice to say, it marked the end of Schuler’s piloting days, but the continuance of Schuler Shoes history in the making. John Schuler sounds off on key industry terms.